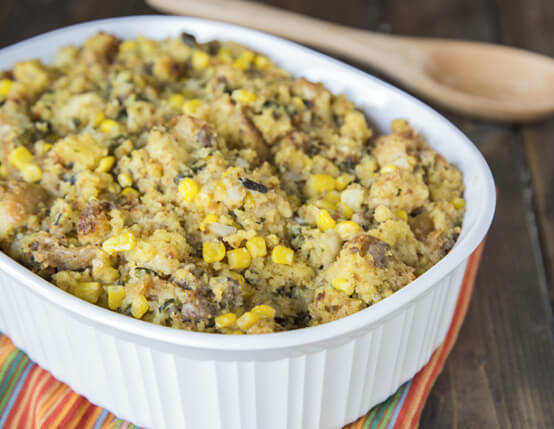 Once you've tried this cornbread stuffing, you'll never go back. 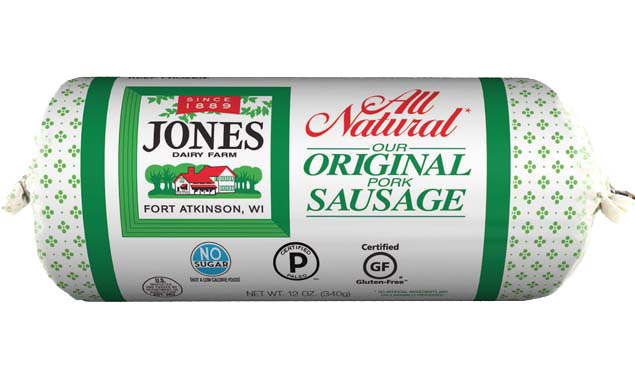 Poblano peppers add a smoky heat to complement the savory Jones breakfast sausage. Preheat oven to 400˚F. Butter 9-inch round cake pan, or 12 muffin cups. In medium bowl, combine flour, cornmeal, sugar, salt and baking powder. Stir in egg, milk and oil until well combined. Pour into pan. Bake for 25 minutes for cake pan, or 15 minutes for muffins. A toothpick inserted in center should come out clean. Preheat broiler. Set poblano peppers on baking sheet and drizzle with olive oil, rub peppers with hands to coat. Place under broiler; cook about 5 minutes per side, until charred and starting to blister.Remove from oven, immediately place peppers into bowl and cover with foil or plastic wrap.Let stand 15 minutes. In saucepan, bring chicken stock, butter, onion, and diced poblano peppers to boil. Add oregano, cumin, salt and pepper.Reduce heat and simmer 20 minutes. Meanwhile, in large skillet brown sausage until fully cooked. Remove sausage from pan; set aside. Add corn to same skillet and sauté until golden brown. In very large bowl, toss together white bread, corn bread, sausage and corn. Slowly add chicken stock mixture, mixing until bread is just moist (not soggy). You may not use all stock. Pour bread mixture into buttered 2.5 quart baking dish. Cover and bake 35-40 minutes. You can cube both breads and let sit out for a day or two to dry out if you have time. Or, bake bread cubes at 300˚F for 30-40 minutes until slightly crispy. Everyone was asking for the recipe for this stuffing. I would highly recommend getting the bread made/cubed at least a day before making the stuffing. Allowing time for the bread to dry is super helpful when getting this all mixed up. The peppers, corn and cornbread add amazing flavors without adding too much spice. I'll go back to this recipe again and again.